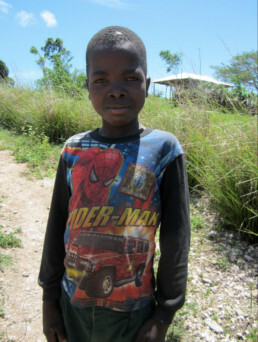 I ran across Spider-Man the other day (I didn’t know superheroes lived on La Gonave!). Over time I have trained my eye to spot them. They don’t exactly wear capes nor do they scale tall buildings. Superheroes incognito. Take Joseph Yves. On any given day he can be found working with village leaders in villages all over the island, teaching and encouraging them that better days could be ahead. And, while he’s a pretty humble superhero, he’s a superhero, nonetheless. Because he is probably responsible for saving more lives than most anyone else around. Consider this past year… under Met Yves’ watch, some 500 family households now have a family latrine. Significant, when you figure that fewer than 10% of households on the island have a latrine, and that cholera has already snuffed out some 7,000 lives. Met Yves doesn’t need to wear a cape or drive a batmobile to prove anything. Real heroes don’t need that stuff. He’s just plain getting it done. If anyone runs across Joseph Yves’ rookie card please let me know. I’d love to take it off your hands. 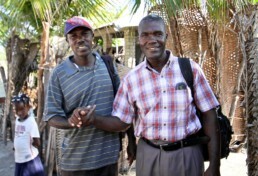 Sidenote: just today we transfered funds to Met Yves for another 100 family latrines. Joseph Yves (on the right)… a true action hero.